The Community Conservation Corps (CCC) was formed in collaboration with the Furman University Shi Center for Sustainability. With its three-pronged mission to reduce energy consumption, promote homeowners’ financial stability, and increase environmental awareness in Greenville, South Carolina, the CCC has been seeking to reduce the total carbon offset of Greenville homes in alignment with Furman University’s goal of carbon neutrality by 2026. The CCC achieves its mission by performing free home weatherizations for low-income clients, thus reducing the home’s energy usage and saving the clients money on utility bills. Weatherizations modify the homes in ways including, but not limited to, sealing of HVAC ductwork and installation of floor and attic insulation, weatherstripping, water heater blankets, water pipe insulation, and energy-efficient light bulbs. Partnering with Habitat for Humanity, the CCC organizes a team of both student and community volunteers to weatherize homes under the direction of a professional contractor. In order to evaluate the numerical impact, an experienced BPI-certified home energy auditor performs tests to the home before and after each weatherization. These audits include blower-door tests, duct work analysis, and other examinations of the home. While these tests are informative and confirm the immediate positive effects of the weatherization, a better look at the long-term impact comes from a four-year analysis of the home’s electricity and heating bills. From these bills, we can see how many kilowatts of cooling energy and how many therms of heating energy are used to heat and cool the home before and after the weatherization. Thus, we can calculate how many metric tons of carbon dioxide have been avoided and how much money we have saved the homeowner. This data shows how impactful the Community Conservation Corps has been. From its founding, the CCC has weatherized over one hundred homes and has an extensive waitlist of many more homes that it projects to weatherize in the coming years. Furman University emphasizes the financial savings its program grants participants. Students and local volunteers install efficient lightbulbs to reduce electricity consumption. The Community Conservation Corp relies on student involvement in every aspect of its work. 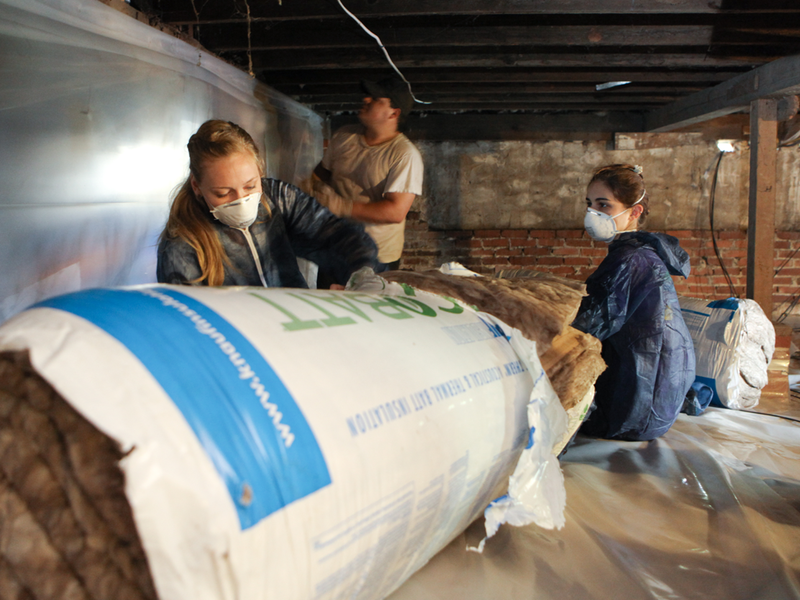 On weatherization days, students from various organizations at Furman University such as the Heller Service Corp, the Shucker Leadership Institute, the Shi Center Student Fellows, the Bartram Society, a variety of sustainability-related classes, and various fraternities, volunteer to help. Also, one student fellow works alongside the CCC program coordinator to help collect, organize, and analyze the data received from the energy companies in order to comprehensively analyze the results of the weatherizations in terms of the CO2 offsets and monetary savings. 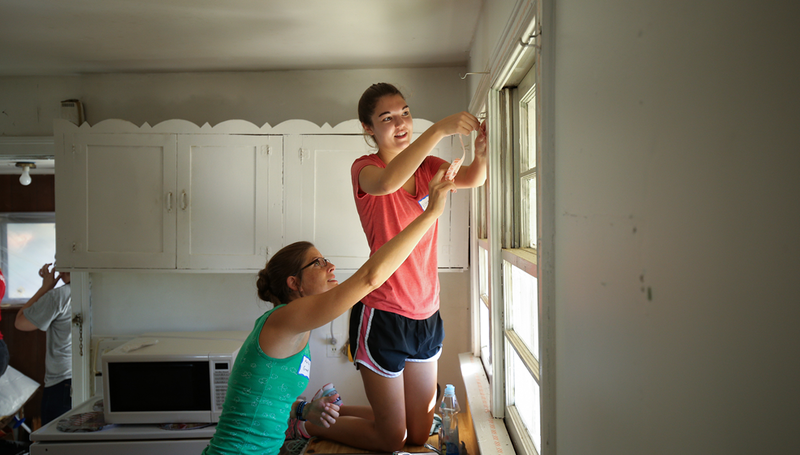 Students apply insulating weatherization strips to prevent heat-loss through windows. Students prepare to install insulation in floor and around hot water pipes with contractor. The Community Conservation Corp performs under the Shi Center for Sustainability at Furman University. 410.89 mtCO2e over six years.